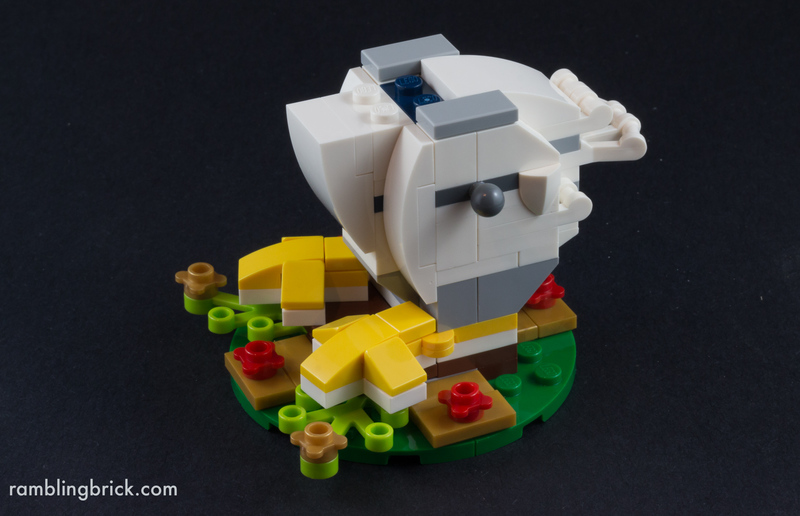 For the third year, LEGO have released a seasonal set to commemorate the Lunar new year, featuring animals of the Chinese Zodiac. The previous two sets, for the year of the sheep and the year of the monkey were only available in Asia. 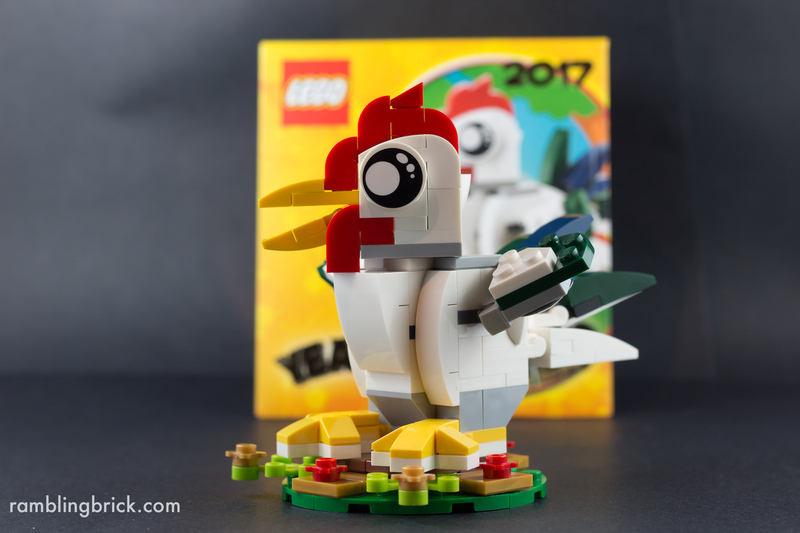 This year’s set, for the Year of the Rooster, was previously announced to be exclusive to the Shanghai and Leicester Square LEGO Brand stores. Imagine my surprise as the word went around last week when one of our local department stores, Myer, announced that it would have some available. Admittedly not in all stores. Only four out of more than sixty locations nationwide will have it available (two in Melbourne, two in Sydney). Fortunately, one is my local. Free with a purchase of 88 dollars or more. When I went, it coincided with a weekend with 25% off LEGO. As a result of this, I spent a bit more than $88. 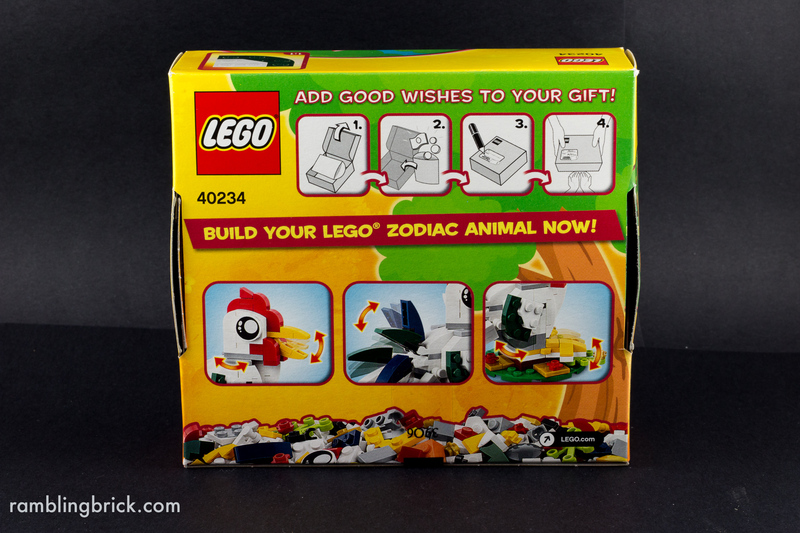 The box is curious, compared to the majority of LEGO boxes these days: it is designed to be opened and resealed: inside the box is an envelope to place a gift of money into, according to Chinese tradition. Although it is bright yellow rather than the traditional red. 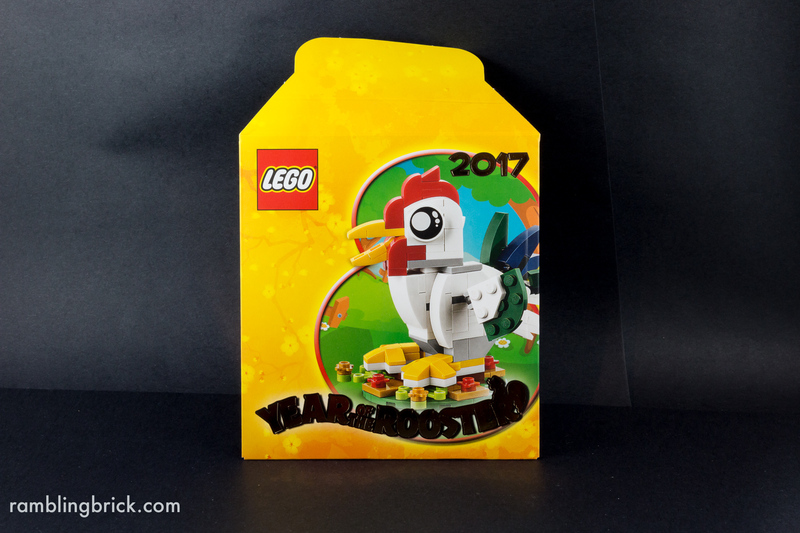 Red LEGO themed envelopes were also given away in conjunction with this promotion. 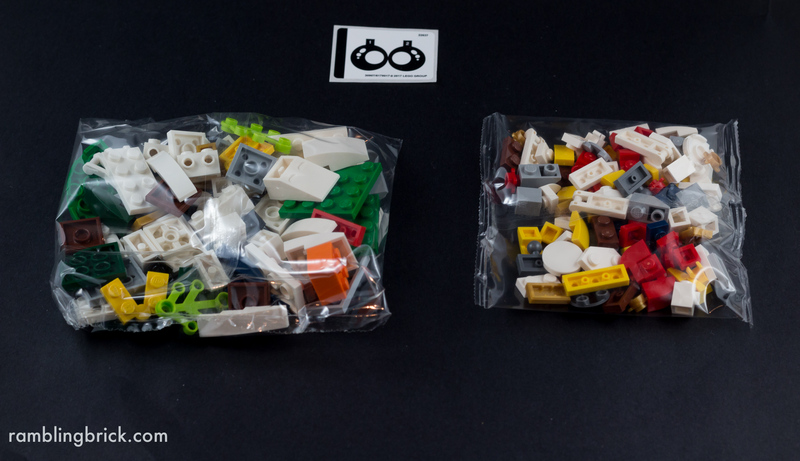 The box also contains 2 plastic bags of pieces, an instruction book and a sticker sheet. There are no exclusive pieces in this set, however it contains a great number of white curves, as well as dark blue and dark green. There are also 2 white ‘cross’ plates and some pearl gold flowers. These flowers are otherwise only found in the Big Ben Creator set released last year. 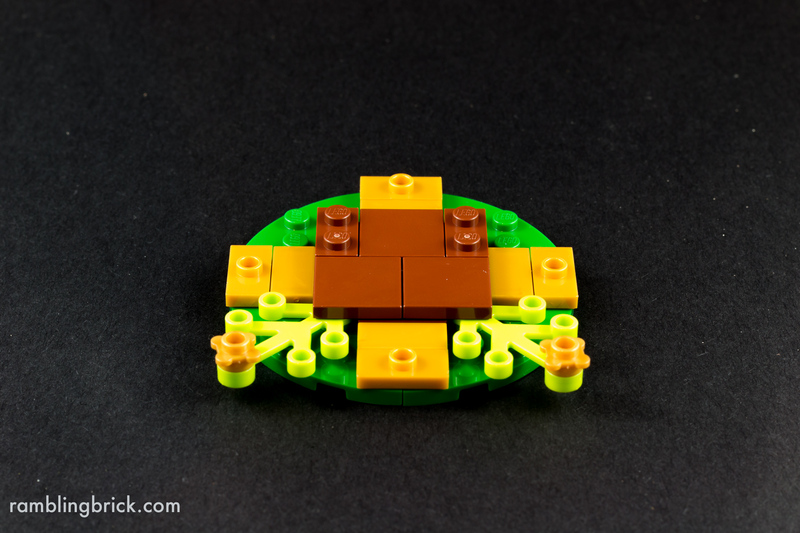 The build is straightforward: beginning with a circular base, decorated with gold tiles and red flowers. These colors are traditionally associated with the lunar new year, and make a great start to the build. We start work on the feet, based on the cross plates. Yello horizontal hinge plates and tiles on the base allow the positions of the legs to be moved off the grid. 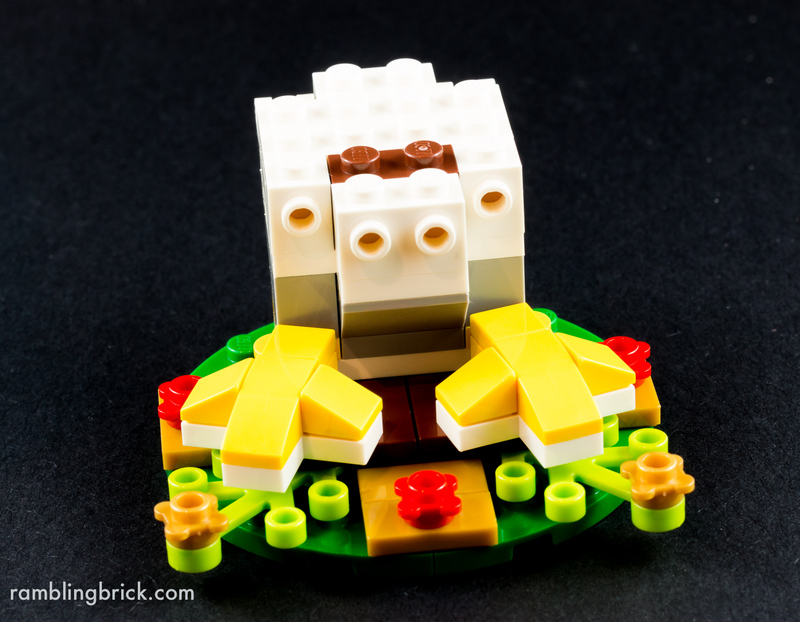 Bricks with studs on the side allow for curves to be attached to the form the rooster’s breast. As we build up, a number of clip bars allow connection of further curves used for tail feathers. We then start work on the rooster’s head, with red curved slopes used very effectively to form the comb. Then the stickers. Unfortunately the eyes of the rooster are not printed. This is a shame as I think the design of the eyes would give them great potential for reuse in making Anime or manga type character builds. 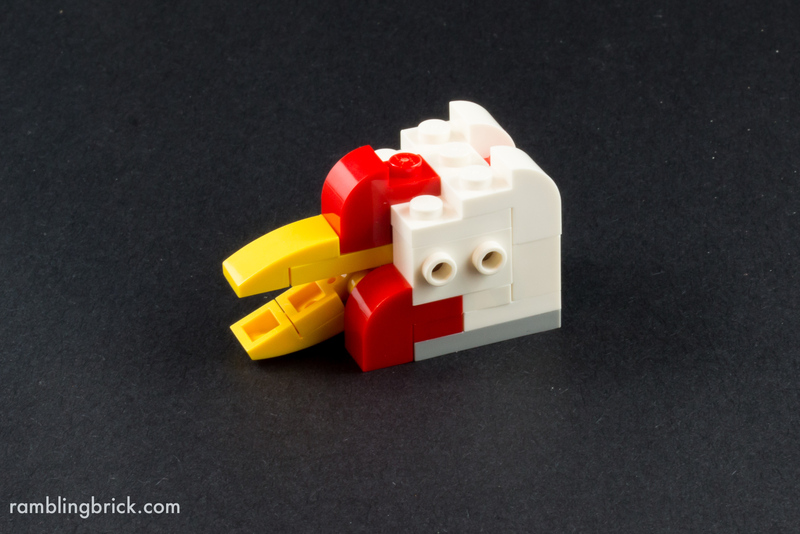 It is important to apply them squarely, as the eyes cannot rotate on the side of the rooster’s head. 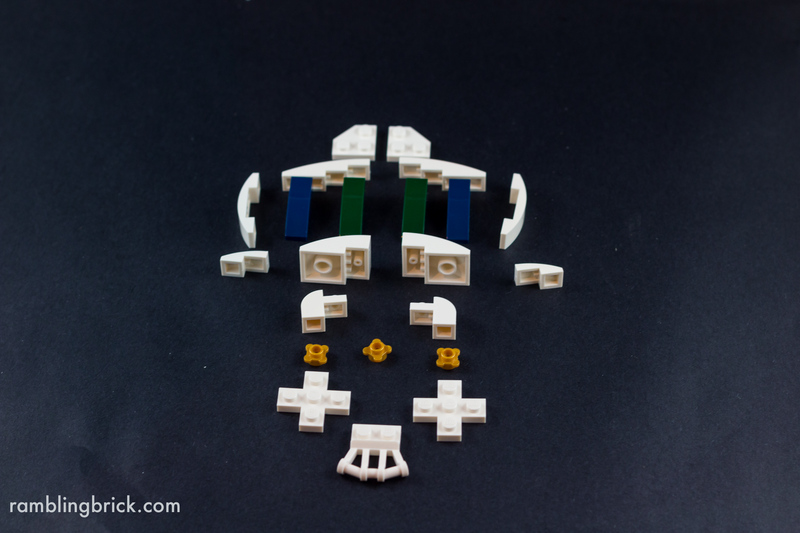 The wings are formed with 2x2wedge plates, another relatively new piece, added to the parts palette in 2016. The use of mixel type ball joints allows versatility in the way you choose to position them. The final build is solid and aesthetically delightful, with a somewhat cartoonish, manga feel. The feathers,wings, feet and beak can all be repositioned and posed. In conclusion, this is an interesting build, with a great final result for display. The gold and red accents on the base highlight the celebration of the new lunar year. For me the eyes are a highlight of the completed model, and I am disappointed that they are dependent on aligning the stickers properly to maintain a consistent direction of gaze. This set is available in Australia at Myer: Melbourne City, Doncaster, Sydney City and Chatswood, with a LEGO purchase of $88 or greater. The promotion runs until February 12, or while stocks last. It is also available in Shanghai, Leicester Square and possibly other retailers around Asia. 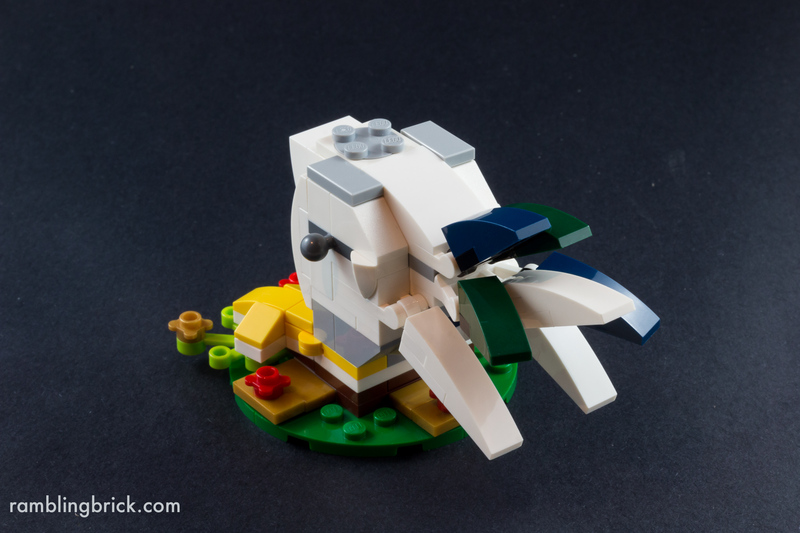 Will this set drag you across town to purchase more LEGO than you planned to this month?